HTC One M9 owners on AT&T, your update is now ready. The Android 5.1 update is going out to customers starting today. Well, yesterday, at least according to the support page text, though we haven't actually heard from any AT&T customers who have actually spotted the OTA yet. In addition to the software goodies in Lollipop 5.1, this build includes "Device Protection." Remember, it may be a week or more before the staggered rollout gets to everyone. Can't wait that long to get software version 2.6.502.16? HTC has provided its ROM Update Utility (RUU) for the upgrade, weighing in at a rough 2.25 gigabytes. That will let you manually install the new build from a Windows PC - it's also handy if you've modified your software in any way, causing the OTA update to fail. But be prepared to lose your apps and data, since RUUs are complete factory flashes. 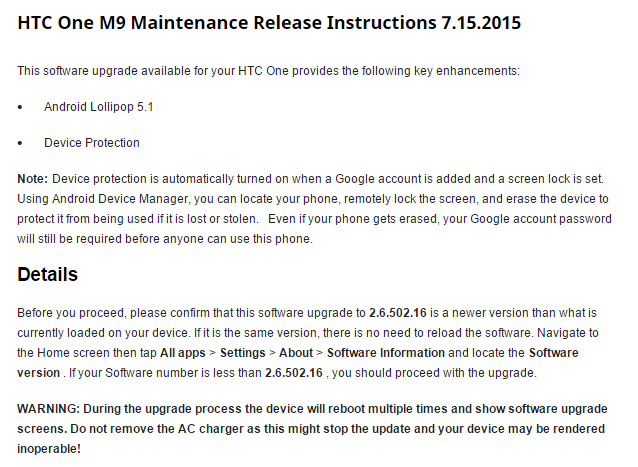 AT&T gets its M9 5.1 OTA out after the Developer Edition and Sprint's version, but before Verizon and T-Mobile. That's doing alright by AT&T's standards. Considering the rather tepid pace of HTC updates, I wouldn't expect the incremental Lollipop 5.1.1 update at all - they're probably just going to wait until Android M.